Some years ago, a fairly old lady approached me after she saw my paintings at a show. She 'confessed' that a bunch of Yellow Lady's Slipper Orchids thrive in her back yard. I was invited to see them. My jaw dropped, completely! They were so beautiful! I started to study them right away, but it was a bit too late. Soon, the flowers got brown spots. I was determined to study them very closely during the rest of the season. The lady's German shepherd was getting used to me in the meantime. I had good amount of drawings, and more than enough studies, not to mention hundreds of photos taken from every possible angles. However I could not start painting. I needed more time. I needed to get to know the lady's slipper better. In the next fall and winter, the sketches and photos were lingering in my head until I decide the composition. In the next year, she carefully potted a couple of plants in early spring, so I could observe the blooming process closely. Without her kind support, I could never capture the most beautiful line and shape of the very unique plant. In the meantime, she lost her husband due to Alzheimer, had to give away her beautiful German shepherd, and moved out from the house leaving her wonderful collection of native plants behind, including many Yellow Lady's Slipper Orchids. Knowing that they might not thrive when transplanted, she didn't want to take the orchids with her. The specimens she had potted for me was replanted in my friend's back yard. 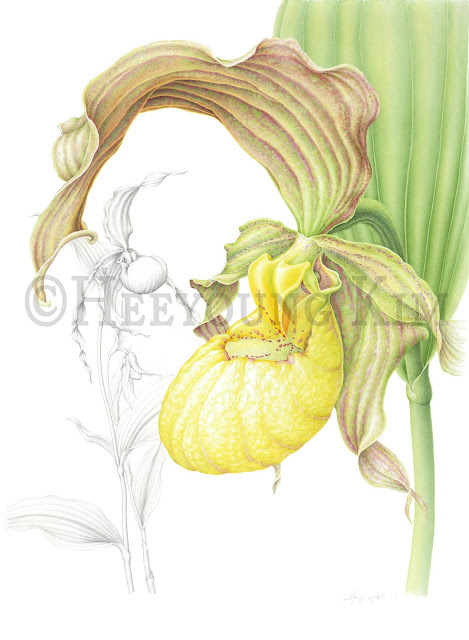 A piece of beautiful life of a lady is immortalized in this painting of Lady's Slipper Orchid. I thank her greatly. This one is truly a brilliant tribute to your lady..I'm surprised by your awesomeness and innovation.This is probably the best painting..Thank you very much for sharing.Keep posting..